Get out of Jail Free Card: Viewing faith as merely a release from trouble. Playing Piece: Viewing faith as identity (hat, thimble, car, etc). Either you have an identity and are ‘in the game’ or you are a casual spectator who does not have an identity. Which are you? This message will show why our faith rests in the person of Jesus. We will do so by examining a curiously religious man named Nicodemus. To start with Nicodemus was a Pharisee. Pharisees were a religious sect of Judaism that interpreted the Law with extreme careful exactitude (Josephus). – They sought strict adherence to the words of Scripture. They even went so far as to add traditions to the Law to assist in obedience to God. – and on top of all that had doctrinal truth believing the resurrection (Acts 23:8). Pharisees sound a lot like today’s “Religious Right”. Nicodemus was a Pharisee yet he approaches Jesus with a question. One of the realities about religious people is that even they have unanswered questions. Nicode mus knew Jesus was from God because of the miracles and teaching He was doing. But his opinions about Jesus were not personal. He did not fully engage Jesus with commitment but with curiosity. 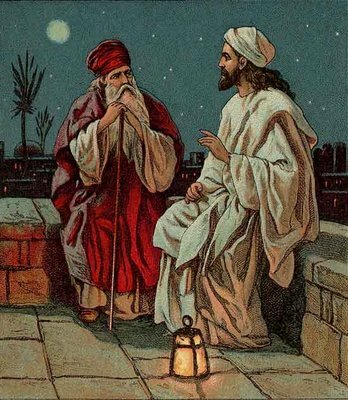 Nicodemus approached Jesus with curiosity and perhaps some hesitation. Pharisees had authority among the Jews which is likely why Nic came to Jesus at night, to not diminish his own authority. As a Pharisee he was intrigued about Jesus’ teaching and actions. Jesus had just turned water into wine in purification vessels and also cleansed out the Jewish Temple, essentially claiming divinity (John 2). Yet, Nic viewed Jesus as a Rabbi (teacher) and a miracle worker from God; not necessarily or fully as being the Messiah. Jesus’ responded with authority. In the original language, John used the words “Amen, Amen. I say unto you…” as a sign of Jesus’ assurance and certainty in His teaching. Jesus can be certain about the truth of His teaching because He is more than a Rabbi or prophet from God – He is God. Jesus is the divine Son of God, the Word Creator who became flesh to reveal the Father (John 1:1-3, 14-17). ~ Note: To affirm Jesus’ full divinity among the divinity is to reject every other cult & religion. Today there is great resistance to identify Jesus as more than a good teacher or messenger of God. However, when examining His teaching and His actions one can clearly see that He claimed to be God. So, to believe Jesus’ words is to believe the words of Almighty God. Jesus has the full authority of God who says you will see the kingdom of God and be set free from sin through a faith that is “born from above”. Being born from above means having a renewed and forgiven spirit, and a renewed authority to live under. Whether than living for self, you are now living for above – the kingdom of God. Therefore, your certainty of salvation does not come from your performance but from the power and person of Jesus. ð How do you respond to authority? Do you realize Jesus is not just Savior but also Lord? As Jesus continued to tell Nicodemus that he had to be born from above to see the kingdom of God, this caused confusion for Nicodemus. Nicodemus thought merely physical, thinking this meant he had to exit his mother’s womb a second time. Jesus gave further explanation saying that this new birth would not be physical but spiritual; “of water and the Spirit”. God does not hide Himself from those who truly want to seek Him. John is showing in these Jesus Encounters that God is available (cf. 1:11-14). The Spirit blows through like wind for us to know and experience. God’s Spirit is available to all those who surrender to God on the basis of repentance and faith (v.15-18). Being born from above and awakened to new life is not another religious ritual to perform… raise hand… walk an aisle… check this box type of mentality. What Nicodemus needed and we all need is an awakening of Jesus in the very depths of our being. A new and cleansed heart. This is more than mental assent but a heartfelt devotion that forever changes your identity. Jesus shows that being born from above and of the Spirit is to recognize the identity of Jesus – the One whom descended from heaven to be lifted up and was sent by God to save all who would believe. So loved the greatest degree. Hell is a literal place contra Rob Bell’s “Love Wins”. – Theological Universalism says no. – Functional Universalism says no too! Religion is ingrained in psyche to approach God based on ritual or performance. Christianity gives acceptance and affection by God based on Jesus’ performance.